E-Journal reader Eric Moakley recently spotted these go playing lawn gnomes in a Rite-Aid in Boulder CO. “Though no one in the store knew the game, I was happy to see go out of a normal context, says Moakley. 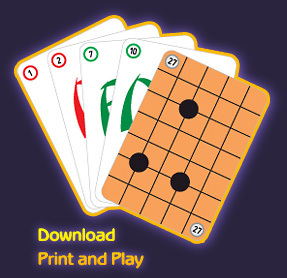 A new game called Dango combines the rules of go with the mechanics of a card game. Players use two kinds of cards, representing either go shapes or “actions”. 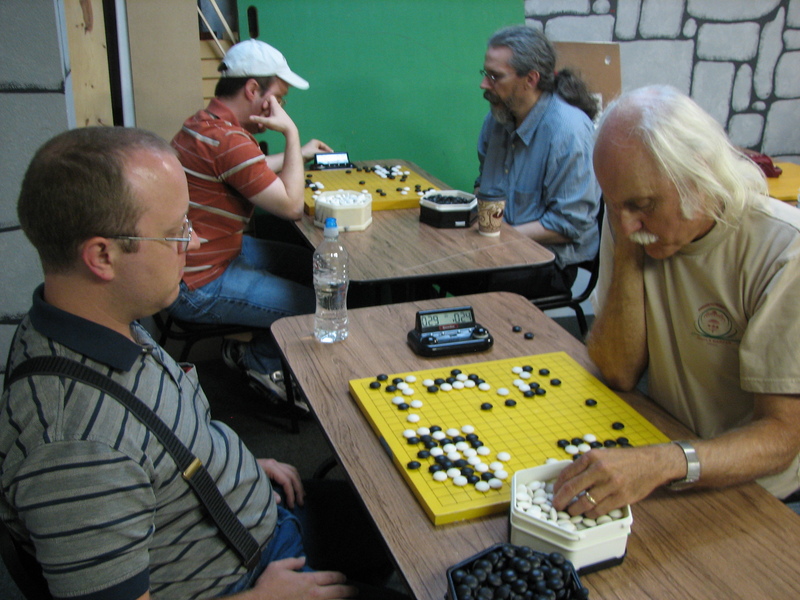 The go shapes are used to play stones on a goban, while the actions allow (or require) players to do various things, like remove opponent’s stones, lose their turn, or block a move that an opponent wants to make. Cards can be downloaded and printed out or sets can be purchased from Alexander Dinerchtein. Calling it “an indispensable study tool and reference work,” Kiseido has just released the 21st Century Dictionary of Basic Joseki, Volume 1 in English. This first volume of the dictionary covers not only long-established josekis familiar to players of all levels but also the many new variations of old josekis, such as the Magic Sword and the Large Avalanche, that have been developed in recent decades, including the first decade of the 21st century. “Each joseki is backed up by numerous diagrams exploring alternative moves and mistakes, to ensure that the reader understands the joseki fully,” Kiseido says. 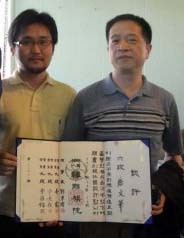 The author, Shinji Takao, is a top Japanese professional who has held both the Honinbo and Meijin titles. His book retains the variations from its predecessor that are relevant to contemporary play but also gives countless new variations, reflecting the widespread innovations generated by professional go in the Far East in the last three decades. Kiseido is currently working on a translation of the Dictionary’s second volume, scheduled for a 2012 release. Check out the Kiseido Newsletter for more information on this and other newly-released books. 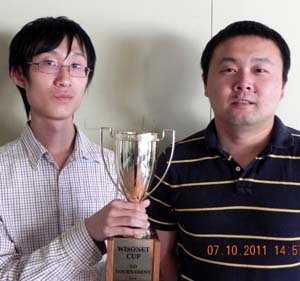 Andy Liu 7d (l) defeated Minshan Shou 7d (r) in the Wisonet Cup finals held on July 10 in Somerset, New Jersey. Liu’s convincing 2-0 sweep “shows that he is a young American go star,” said Cup organizer Ronghao Chen. Liu won both games without needing to count or go into overtime. “In the second final game Minshan Shou had a chance to kill a 15-stone group of Andy’s,” reports Chen, “but he didn’t know that he could kill this group and missed his opportunity to win immediately” and force a third round. 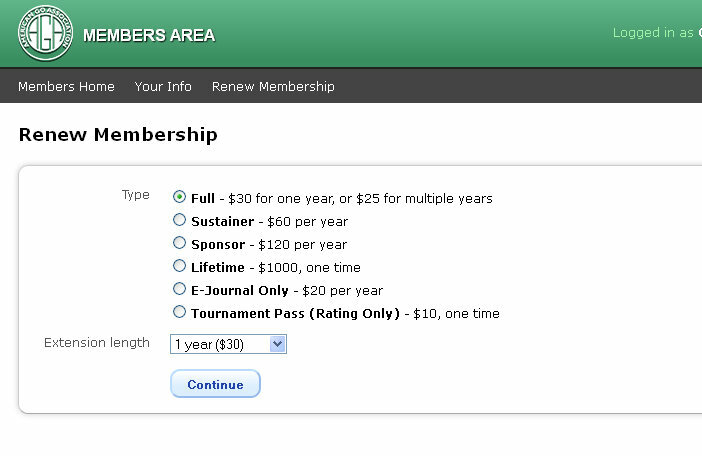 Chen tells the E-Journal that the Wisonet Cup Go Tournament will run again in Spring 2012. 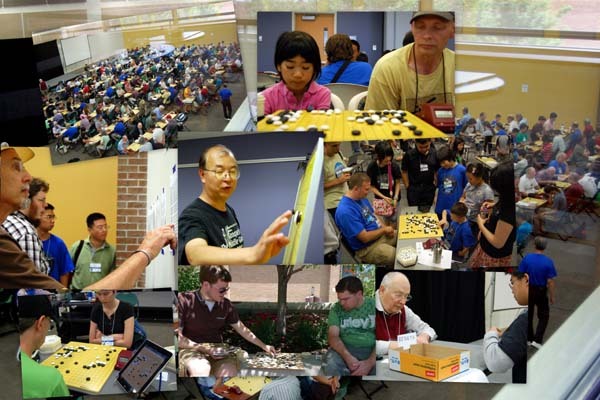 Myung-wan Kim 9P reports that the Korean Baduk Association has decided to award rank certificates to the winners of all six dan divisions of the US Open at the upcoming U.S. Go Congress in Santa Barbara. “The 1d up to 6d certificates are handsome, suitable for framing, and quite hard to obtain,” reports AGA board member Andy Okun. Antonio Egea has reported back from the Shanghai Go Camp, which is currently underway in China. After two weeks of daily go training, at Shanghai International Studies University, the participants are ready for their next challenge. “It looks like the tough part will start now,” says Egea, “we are going to Hangzhou to receive training with the local go students.” Participants have also had time for some sight-seeing. They’ve visited The Bund – a world famous section of Zhongshan Road in Shanghai – and also Zhou Zhuang, which Egea describes as “a Venice-like city”. 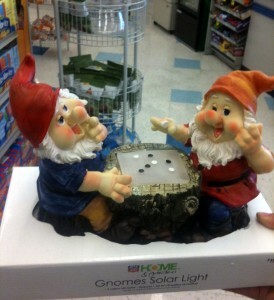 Based on Antonio’s report, direct from Shanghai Go Camp at Go Game Guru. 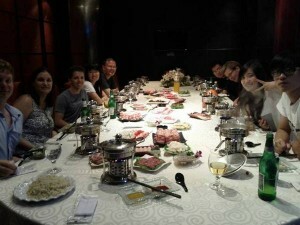 Photo: Go Camp participants enjoy dinner together at a hot pot restaurant. With this year’s U.S. Go Congress just a few short weeks away – July 30 through August 7 in Santa Barbara, CA – attendance is shooting up faster than summer temperatures. In addition to a spectacular site right on the coast at UC Santa Barbara, the 8-day event features the U.S. Open – the largest annual Go tournament in the US – the North American Ing Masters – 16 of the strongest amateur and professional players in North America, the Redmond Cup – the preeminent youth tournament of the year – as well as lectures and simuls with 19 professionals, go vendors and more go than you can possibly imagine (yes, the Midnight Madness tournament is back!). There’s plenty for non-players to do in the area (click here for details), and soccer and tennis players should be sure to bring their gear, as there’ll be opportunities for ball games as well as the board kind. So mark your calendar, book your flight and register now! With three professionals, six North American Ing Masters champions and four top Canadian reps you won’t want to miss the opening rounds of the Sport Accord Mind Games (SAMG) qualifier this week on KGS starting at 8p EST. Pairings include top-seeded Feng Yun 9P vs Yuan Zhou 7d, Mingjiu Jiang 7P (seeded 2) vs Gansheng Shi, Andy Liu (4) vs Calvin Sun, Huiren Yang 1P (5) vs Hugh Zhang, Juyong Ko (7) vs Daniel Chou, Sorin Gherman (8) vs Lionel Zhang and Kevin Huang (9) vs Xianyu Li. Dae Hyuk Koh (6) will play Bill Lin at 10p EST. In the two SAMG matches on Sunday, July 10, Jie Li (3) defeated I-Han Lui and Seung Hyun Hong (10) won over Yinli Wang. The top five players will represent the U.S. in the SAMG this December in Beijing, China. Watch KGS for schedule details: Rounds 1 & 2 are this week; Rounds 3 & 4 are next week and Round 5 will be the week of July 25; the updated schedule will be posted on the AGA’s website. John Redford (front left) drove all the way in from Arkansas to score a perfect 4-0 and win the July 9 White Crane tournament in Austin, Texas. Tied for second place with 3-1: John Andrichack, Sang Ho Lee, Roger Strain, Landon Dyer, and Ian Mitchell. Click here for an album of tourney photos.